Go Wild PeruGuided wildlife tours Customised wildlife tours tailored to suit your interests. "The trip with Go Wild Peru was certainly one of the best travel experiences I had in SA so far. Facilities, cars and mainly the support by Lance and Fernando were outstanding. If you want a real fishing trip combined with excellent logistics and information, your choice should be GWP. I will come again!" We currently offer three fish collecting packages - an 8, 11 or 15 day package. This is the ideal trip for those with limited time and is a fairly intense package with six full days of fish collecting. A dedicated package for the Killifish enthusiast with 6 full days of fish collecting. After being picked up from the airport and introduced to the staff and local guides, experience the local culture and get a real feel for the area with a tour of the town and marketplace. Enjoy 4 days of fish collecting locally, plus a 3 day trip to the home of Corydoras weitzmani, sampling various sites en-route. Download our reservation, waiver and medical forms to start your journey with us. These forms are required for any booking made. The area in which we are based and visit for fish collecting trips is very rich for Orchids. With over 2,000 species known in our and the worldwide interest in Orchids, we have extended the scope of our tours to include specialist Orchid Expeditions. GoWildPeru is pleased to offer sightseeing excursions. We partnered with one of the top travel agents in Peru to bring these exclusive offerings to our clients. We are only offering side trips we recommend from personal experience. Accommodations are in carefully selected hotels. The Cuzco/Machu Picchu package includes two nights in Cusco with options for additional nights. We strongly recommend considering the three night trip. The Classic Lima package includes two nights in Lima with options for private and group tours. We can always accommodate special tourism requests. Just let us know your interest or ask us to make recommendations. Please be advised that if you are interested in trekking the Inca trail to Machu Picchu reservations are required one-year in advance. To keep up-to-date with all of our upcoming events, please take a look at our Facebook page. 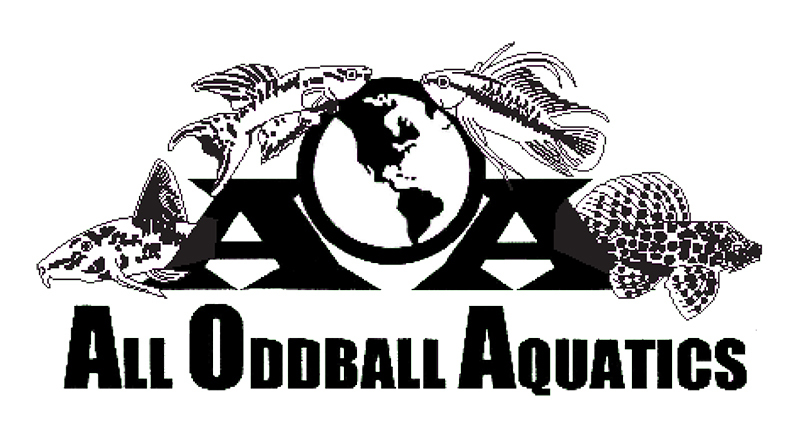 All Oddball Aquatics is a proud sponsor of Go Wild Peru. 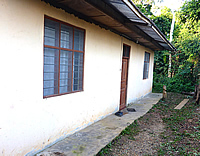 Accommodation at GoWildPeru consist of two fully fitted bedrooms including lockable storage units, enabling clients to lock away items they do not wish to carry with them on collecting forays. We installed new beds and mattresses and provide bed linens, blankets and towels. There are two showers, one outside for rinsing down after a muddy days fish collecting and a warm shower in the house. 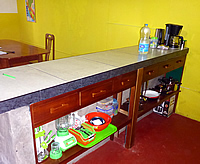 The revitalised kitchen now has ceramic work tops with adequate storage and equipment to accommodate dinner for at least six. There is a new fridge/freezer, perfect for keeping that well earned beer cool. There is a relaxing area with two comfortable sofas and a low coffee table. We also installed a charging station so that all your electronic equipment can be kept full charged and ready for use. We will provide a housekeeper during your stay, who will keep everything clean and tidy, make and or change the beds, prepare an evening meal for when you return from a collecting trip, and make sure there is food available for your self-catering breakfasts and packed lunches. There is also a laundry service, but this is not in the tour package and must be paid for as required. We think you will find this to be one of the most comfortable places you can find anywhere in the Peruvian Jungle. The Aquarium had a major overhaul and now consists of 36 x 48 imperial gal (58 us gal) tanks, each with its own air supply. The tanks are installed around the periphery of the aquarium room with a wide pathway and a large central platform ready for any future expansion. There are also two ceramic tiled packing/work benches and a dedicated quarantine area to condition all your newly collected fishes. We have a limited number of dip nets available for clients use and can on request purchase new ones at cost on clients behalf. There are seine nets available for clients use and our guides will be on hand to demonstrate how they are best used. If clients so wish they are welcome to bring their own nets. 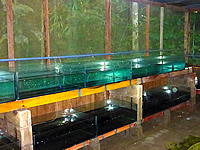 We are very proud to be using Swiss Tropicals as our exclusive provider of fish food and filters to the GoWildPeru aquarium in Puerto Maldonado.